Gadacz, René R.. "Umiak". The Canadian Encyclopedia, 15 December 2016, Historica Canada. https://www.thecanadianencyclopedia.ca/en/article/umiak. Accessed 24 April 2019. Until recent times, the umiak — which means “open skin boat” in Inuktitut — was the primary method of summer transport for coastal Inuit, used for moving family and possessions to seasonal hunting areas and for whaling expeditions. 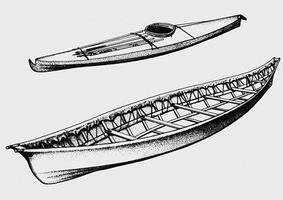 The kayak is a narrow hunting boat made of sealskin stretched over a wood or bone frame. The larger umiak was used for transporting goods and people (artwork by Gordon Miller). The umiak dates to Thule times (1000 CE) in the central Arctic and appeared in Greenland, Baffin Island, Labrador, the Mackenzie Delta, Alaska and eastern Siberia. The craft could hold more than 20 people and was six to 10 m in length and more than 1.5 m wide at the centre. The frame was constructed of salvaged driftwood or whalebone, and hide lashings on pegs of antler, ivory or wood held the boat together. Hides of bearded seal sewn together with waterproof seams were stretched to dry tightly around the frame. Families sometimes shared ownership of umiaks and used them to carry heavy loads of passengers and equipment during seasonal moves and the whale-hunting season. Umiaks are rarely used today. They have been replaced by motorized crafts that bear resemblance to traditional umiak shape and design. E.Y. Arima, Report on an Eskimo Umiak Built at Ivuyivik, P.Q., in the Summer of 1960 (1963).